News | Greater Sydney will become three connected cities over the next 40 years, linked by new public transport, giving more communities access to job opportunities, new homes and services within 30 minutes. 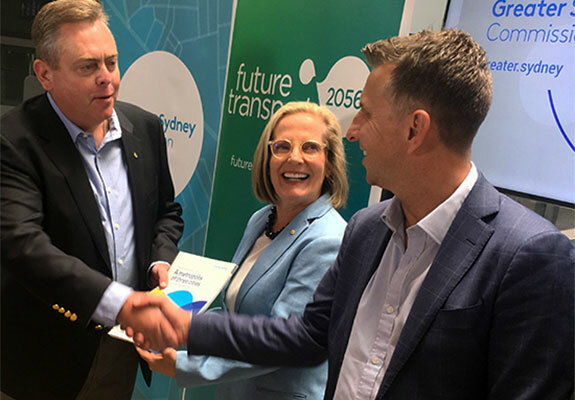 The draft Plan, prepared by the Greater Sydney Commission (GSC) was launched for public comment together with Transport for NSW’s Future Transport 2056. Chief Commissioner Lucy Turnbull AO said the plans were the first long-term land use and transport strategies to be developed both collaboratively and concurrently. “The three cities vision is also at the heart of Future Transport 2056 and I’m delighted to see the close collaboration between our agencies bring this vision to life,” Ms Turnbull said. “Reshaping Greater Sydney as a metropolis of three cities – the Western Parkland City, Central River City and Eastern Harbour City will rebalance it, fostering jobs, improving housing choice and affordability, easing congestion and enhancing our enviable natural environment across the entire region. “This is particularly exciting for Sydney’s west, with an entirely new city to emerge west of the M7, where the new Western Sydney Airport and Badgery’s Creek Aerotropolis will support tens of thousands of jobs. “Penrith, Liverpool and Campbelltown will become university towns, which means even greater opportunity for young people growing up in the West. “This draft Plan has been developed with the input of thousands of Sydneysiders and I’d like to thank everyone who has helped us shape this Plan. I now encourage everyone to read the draft Plan and give us their feedback,” she said. The draft Greater Sydney Region Plan is on exhibition until 15 December 2017. Read the Ministers' media release - More jobs and infrastructure for Greater Sydney (PDF, 118KB).